Cut a piece of green paper ribbon 5 1/2 yards, untwist and wrap around entire styrofoam wreath. Cut four pieces of green paper 12″ long. Untwist and glue lace to one side (lengthwise). Do the same with the red paper, but only making three. Fold paper to form a fan. Glue a green fan near the top of the wreath. Next glue a red fan slightly overlapping the green one. Repeat with the remaining fans. Wrap the pearls around the wreath and secure with glue. Cut eight or ten pieces of both colors 8″ long and untwist all but one inch. Glue the open ends to the wreath as a background to the bow. Cut several pieces of each color about 10″ long. 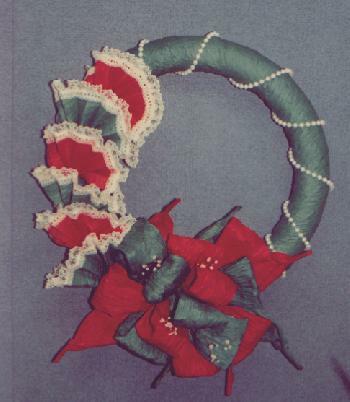 Fold each one in half and glue ends to wreath so it looks like a bow with several loops. If desired, add a few loops of lace in with the paper.